Two species of wart snakes inhabit the coasts of eastern Asia and the Indo-Malaysian region. Of these the Elephant Trunk Snake is found in the eastern half of the range. 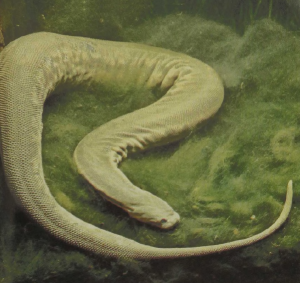 These are most curious-looking animals, as their skin appears to be draped in loose folds, particularly when the snake is exposed on mud flats after the tide has receded. The skin used to be made into specialty leather known as karung. In the water, Elephant Trunk Snakes are far more graceful: they swim effectively and seem to move along without effort. To do so they flatten the body, pulling the sides together into a vertical band. Unlike those of most snakes, their scales are conical and apparently used to hold onto slippery fishes which they catch between coils of their body. In all other snakes the intestine runs more or less straight down the length of the body, but the Elephant Trunk Snake has a coiled small intestine. If unwound the intestine of a 3-foot snake would measure more than 6 feet.